Last night I put up a post about the greatest challenges we faced in 2012. From escalating conflict in the Middle East, to quarreling politicians, to climate change and finally to this year’s horrible mass shootings, our world faced (and continues to face) unbelievable tragedy, sadness, and adversity. But while it’s easy, and somewhat natural to focus on all of the negative I think it’s important to remember all of the good growing in this world, much of it blossoming this year and in the face of 2012’s greatest tragedies. In the wake of the Sandy Hook shooting, many news programs invited expert child psychologists onto their broadcasts to address the issue parents throughout the country were now facing…”How do we talk to our kids about what happened at Sandy Hook?” A few of them referenced a method that came from the philosophy of a man who I spent hours watching and learning from as a child…Mr. Rogers. On the last day of this year I want to dedicate my time and energy to those I believe are 2012’s most inspiring “Helpers.” A few of these people I had the privilege of meeting and speaking with. Their courage and commitment to making the world better had a profound and lasting impact on me this year. The others are stories that stood out for me – the inspired acts of ordinary people who faced great adversity and sometimes grave danger. They’re people I’ve never met, and probably never will. But whether I read about them or saw their story on TV, they proved to me that no matter the tragedy or adversity the world will always be full of people that care. One of my favorite things to do every fall is watch ESPN’s College Gameday on Saturday mornings while I enjoy my coffee. On one Saturday morning in November they aired a story about a teenage boy named Anthony Starego. Starego has faced adversity his entire life. Like millions of other children in America, Anthony’s best friend is the strict schedule and routine he relies on to navigate his way through each day. At a very young age, Anthony was diagnosed with Autism. Anyone that knows anything about this disorder understands how difficult it makes social interaction. For someone that has Autism, “fitting in,” is a major struggle, and many autistic children who attend public schools become targets for social alienation and relentless bullying. Like many children with Autism, Anthony can easily become obsessed with the things that really interest him. For Anthony, one of these interests became football – specifically Rutgers Football. In 2006, for arguably the biggest game in Rutgers history, a then 12-year-old Starego was in the stadium with his Father. That night he witnessed the game winning kick by Rutgers kicker Jeremy Ito, followed by thousands of fans flooding the field — celebrating the great victory. This event would shape a young boy’s dream. He later told his father, “Dad, I want to be a kicker.” Anthony’s father knew how difficult this would be for him. A child with Autism like Anthony has severe difficulty with any interaction, never mind getting hit or tackled. But Anthony’s Dad didn’t dispel his son’s dream, he fueled it. A few years later, Anthony — against all odds — won the starting kicker position at his High School. This past October, with only seconds left against his school’s greatest rival, Anthony lined up to kick a field goal that would break a tie-game. In the biggest moment of this young boy’s life he would drill the kick through the uprights; sealing a huge victory for his team. His teammates surrounded and celebrated him, fans flooded the field. That night, Anthony Starego was everybody’s hero. Teenager Anthony Starego, diagnosed with Autism when he was very young, has dreamed of kicking a game-winning field goal since he was 12 years old. It’s difficult to understand what goes on in the mind of a child with Autism. But Anthony Starego proved that all children, no matter what challenges they face, can dream big…and sometimes those dreams really do come true. Next time you think the odds are all against you and you can’t endure, remember that a boy that probably faced much greater adversity stared it in the face and literally kicked it down. I had the honor of meeting one of the Anti-Bullying Movement’s most dedicated and inspiring leaders this past September. A victim of bullying when she was 12, Ashley would later save the life of one of her classmates who confessed to her that he was considering suicide as his only way out. Saving this boy’s life showed Ashley that she was capable of great change. It inspired her to create her own anti-bullying non-profit organization called Students Against Being Bullied. Her mission to prevent bullying in her own school led her to be an anti-bullying advocate for other schools and organizations. To date, Ashley has spoken at well over 60 schools, teaching students and educators alike about what they can do to fight back against the greatest threat her generation faces. Ashley’s work has also brought her to National Conferences where she has appeared as a guest speaker. 16-year-old Ashley Craig is the founder of “Students Against Being Bullied,” a student-led bullying prevention organization. Connected by a mutual friend, Ashley’s world-changing work was already several years in the making by the time we met with her at her High School in Sussex, NJ. That’s right — Ashley is only 16 years old. While other kids her age are worried more about their social status, sports performances, or academic scores — Ashley spends her days not only worrying about the safety and well-being of others, but advocating on their behalf for change. For a kid that’s severely bullied in today’s world, it feels like no one understands or cares, it feels like you’re all alone and up against the world. Ashley has selflessly taken on the role as these victims’ advocate, their protector, their friend. Ashley believes we can live in a nation without bullying someday. She dreams of being in Washington and working side-by-side with others to implement a National Anti-Bullying Bill of Rights. While others look at this issue, shake their heads, and say, “what a shame,” Ashley is leading a charge for change. Her dream is helping others feel safe and empowered enough to follow theirs. Her work allows all of us to imagine a safer, more harmonious world…a better world. In the aftermath of the Sandy Hook Elementary School Shooting, millions of Americans felt the need to act, asking of themselves “what can I do?” NBC journalist Ann Curry answered this question with an inspired solution. 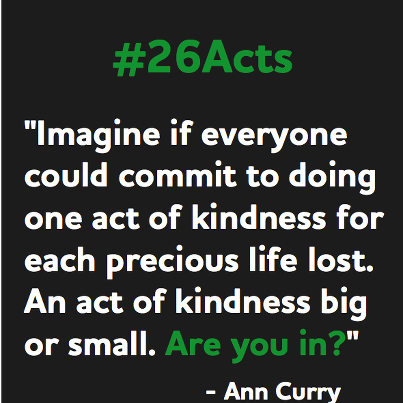 Using social media as her ally, she asked each of us to commit to 26 random acts of kindness. Each act would honor the memory of one of Sandy Hook’s victims. On Twiter, if you type in #26 you’ll be transported to an unending list of significant acts of kindness taking place all over the world and in the memory of those that lost their lives on that terrible day. 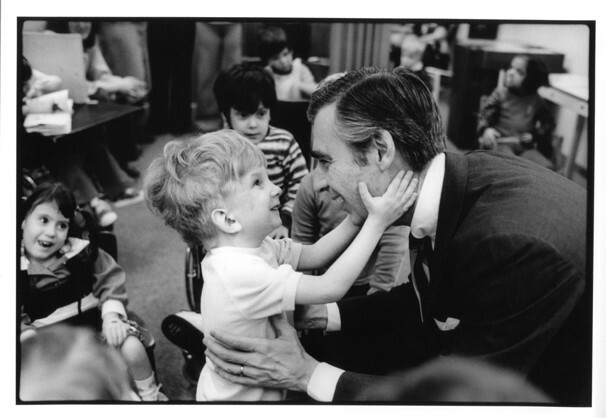 To each and every person that has “Committed to 26,” and will continue to in the New Year…you are one of the Helpers. Hopefully the 27th random act of kindness you commit isn’t a result of tragedy. How wonderful would our world be if we focused more on acts like these…on the random and average good happening every day? We’ll never know until we try. I was fortunate enough to do some work for a charity doing some very important work in the world this past year. Family Reach Foundation provides not only heartfelt support to families whose children are fighting pediatric cancer, but this organization often helps them get through crippling financial challenges wrought by the disease. In March, I had the privilege of meeting a wonderful New Jersey family. In their home, I interviewed a 9-year old girl named Bethany. When we met, Bethany was thankfully coming out on the other side of leukemia in remission. After hearing about her struggles from her parents I asked Bethany about how she battled her way through cancer. According to Bethany she put her faith in God, believing that if she was good that he, “would always keep her.” I asked Bethany about her big dreams. She imagines a big family of her own someday, with a loving husband and beautiful children. Not only does she see herself caring for her own family, but others as well. This cancer has shown Bethany not only the depths of her own inner-strength, but the power that helping others can have. Bethany plans to be a nurse one day, so she can help heal other people like the nurses that looked after her. A few months later, I was standing beside Bethany and her family when she had maybe the biggest thrill of her young life. In that moment, Matt Damon squatted down to her level, and with a big smile asked her what her name was. After she answered, he said, “It’s nice to meet you Bethany, ya know I have a daughter that’s about your age too.” For a kid that already glows, she was beaming. For anybody that doesn’t believe that good things happen to good people — I wish you were standing beside me that evening, because seeing this would’ve proved you dead wrong. I’m still amazed by how much I learned from a courageous 9 year old girl. If she can face cancer, overcome it, and see the world with the same optimism, wonder, and beauty that she does…then what excuse do you or I have to see it any different? There are so many that hopefully someday a book is written just about them. But for now, all I can do is write about the people and stories that I remember the best from that harrowing aftermath. 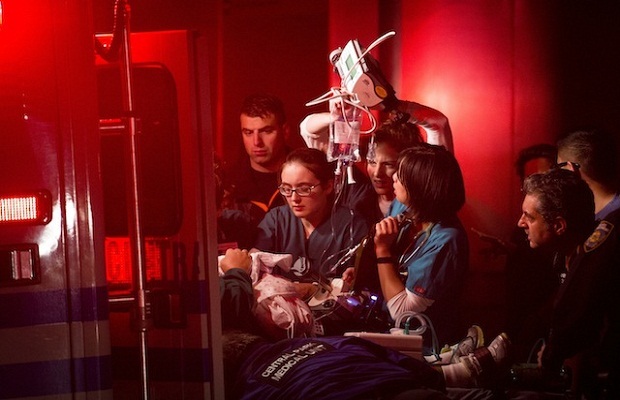 At NYU’s Langone Medical Center, the power outage and subsequent failure of their generators the night of the storm brought Nurses, Doctors, and Emergency Personnel a tremendous challenge. Using mere flashlights to light their way, these helpers carried patients down as many as 15 flights of narrow stairs — one by one — to ambulances waiting below. Many of these patients in fragile, life-threatening condition — including newborn babies being kept alive only by respirators. These children were carried down the stairs, one at a time, by a paramedic while a nurse manually pumped air into their tiny lungs. As far as I know, all of these babies are alive today, and all of them will celebrate their first birthday in 2013. In the immediate aftermath of Superstorm Sandy medical professionals at NYU Langone Medical Center evacuated patients to safety — including newborn babies. First Responders and Energy Professionals worked non-stop for days and even weeks after the storm hit — restoring power to homes and businesses, coordinating traffic, putting out fires, repairing downed power lines, and the heavy presence of so many police officers in every town made all of us feel as if maybe we’d be “safe,” and okay after all. Energy professionals and construction professionals came from states all over the country, down from Canada, and from overseas to lend their time, knowledge, expertise, and energy to the rebuilding effort. Many of them are still working on putting our home back together to this day. Being a first responder or energy professional doesn’t mean that your home is the first one to get, trees cleared, water removed, or power back. Just like the rest of us, their homes suffered damage, their families slept in the cold and waited on long gas lines. But every day that got back up and out, working to restore the basic “needs” of our world. Not only did Sandy remind us that we take complex systems like electricity, water, and waste removal for granted…but that we take the hard workers that maintain these systems and ensure our safety for granted as well. To all of the first responders and energy professionals that worked to bring life back to normal and who continue to do so — thank you for being the Helpers not just in the days after the storm…but every day. 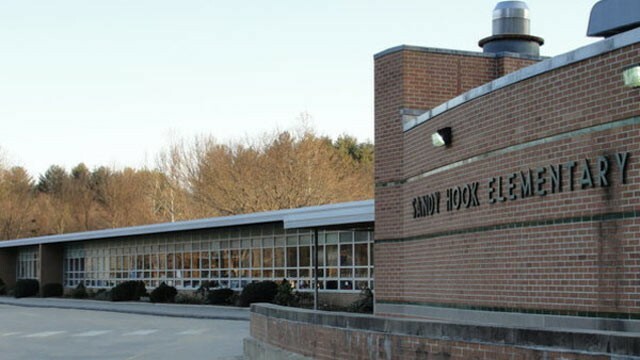 No tragedy this year was more devastating than the mass shooting at Sandy Hook Elementary School. But even as we untangled the details of that morning’s horror, there are many stories of incredible heroism that came to the surface. During his speech at the Newtown Memorial Service on a solemn Sunday night, President Obama spoke to us not as a leader or politician, but as a Father. He simultaneously reminded himself and all of us of the shared responsibility we all have in raising America’s children. We all set an example for them to follow, we all help them learn valuable life lessons, we show them how to grow and face all of life’s adversity with compassion and integrity. 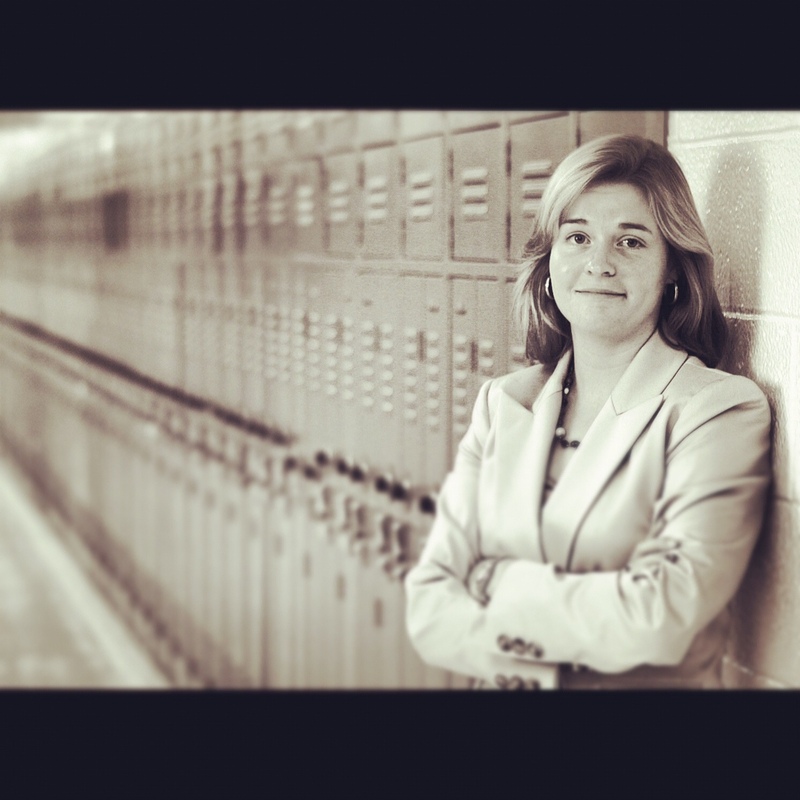 The elementary school’s dedicated principal Dawn Hochsprung believed in the hopes and dreams of every child in her school. She knew that the work that she and her staff do on a daily basis is the most important work anyone can do in the world, but she didn’t look for credit or approval from others. She is remembered by many parents and faculty members as always “positive,” and someone that made parents sending their little boy or little girl off to school for the very first time feel like she deeply cared about their child, and would do everything she could to keep the safe and help them grow. She had advocated for a state-of-the-art security system and made sure faculty and students strictly adhered to the school’s Lockdown procedures. And even when all of these precautions broke down around her, Hochsprung put herself between the shooter and the children under her protection. She led by example, and there were other teachers that day that put themselves between the shooter and innocent children. If not for the heroism of Hochsprung and other teachers that morning we may be remembering 40 or 50 victims today…not 20. On the surface, it may look like the stories of all of these helpers are vast and disparate. But not for me. To me, these helpers have a common, and unmistakeable bond. They all remind us that no matter how alone we feel, how great the adversity we face seems, that we are ALL connected to so many other lives. Some are our family, some our friends, but many others are strangers that we intersect with every day on our crazy journey through this thing we all call life. When we’re not so absorbed by our own plights or problems, when we’re listening to the world around us, and when we’re really trying to find the good out there — they are there. 2012’s Helpers have shown us how to live life to its fullest, how to remain strong in the face of personal adversity and grave, certain danger. They embody integrity, empathy, and show us what true character really is. I remember them as I look back at 2012 and the lessons they all taught me. They remind me that no matter what happens in 2013, to always look around and find “The Helpers,” and then to find a way to become one for someone else. Very inspiring. I can ‘hear’ how passionate you are in every word you write. Congrats to you for all you are, for all you do, and for what great opportunities I just know await you in 2013, just a few hours away!